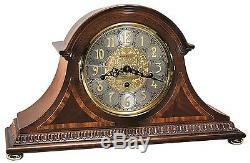 Webster Presidential Series Triple-Chime Mantel Clock 613-559. Arch molding crowns the case, and two triangular, rare crotch mahogany and movingue overlays accent the dial. Impressive dial features intricate vine pattern and Presidential insignia. Dentil molding trims the base, which is supported by round brass feet. Key-wound, triple-chime Kieninger movement plays choice of Westminster, St. Michael, or Whittington 1/4, 1/2, and 3/4 chimes accordingly with full chime and strike on the hour. An industry exclusive Duel-ratchet Winding Arbor ensures safe movement winding. Chime silence option and durable bronze bushings. Finished in Windsor Cherry on select hardwoods and veneers. Depth 6.25 (16 cm). The item "Howard Miller Webster Presidential Triple-Chime Mantel Clock 613-559 Free Ship" is in sale since Saturday, October 4, 2014. This item is in the category "Collectibles\Clocks\Modern (1970-Now)\Wall". The seller is "timekeepers94" and is located in San Diego, California.